“INCOME TAX” IS ENTRAPMENT (A BOOBY TRAP), OR FRAUD IN THE ACTUAL AND POSITIVE SENSE PRACTICED UPON THE UNAWARE CITIZEN! "Income tax” LIABILITY is calculated upon part of your income, BUT that part as “TAXABLE INCOME” (a cunning deception) is not defined in IRS regulations. "Income tax” LIABILITY is based upon receipts of things with so-called “DOLLAR VALUES,” BUT the “VALUE STANDARD” is not defined in IRS regulations. Perhaps because it cannot be: (Value is subjective). "Income tax” LIABILITY is based upon receipts of so-called “DOLLARS,” BUT “DOLLARS” (an artifice for deception) is riot defined in IRS regulations. "Income tax” LIABILITY is based upon receipts of “MONEY” (in terms of “DOLLARS OF MONEY”), BUT “MONEY” (a cunning deception) is not defined in IRS regulations. Everyone who has an “income tax” liability must file a written document (return) under penalty of perjury jurat. This means that every statement on the return must be true and correct, in every respect, BUT WITHOUT accurate definitions for “DOLLAR,” “MONEY,” “ VALUE,” AND “TAXABLE INCOME” it is virtually impossible e to complete a return that could not result in an indictment against the citizen for fraud and/or perjury brought by the IRS officials. Ignorance is no excuse in law, but in the case of “INCOME TAX” ignorance is forced upon the petitioner (citizen) by the respondent’s (official’s) willful refusal to answer questions for truth and understanding, placing the petitioner (citizen) completely at the arbitrary mercy of IRS respondents (officials). If the respondents (officials) will not answer the petitioner’s (citizen’s) questions for truth and understanding then anything the petitioner (citizen) states could be false and untrue; thereby initiating the threat of committing fraud and/or perjury. Respondents (officials) must answer questions for truth and understanding or leave the petitioner (citizen) in an untenable position of fear and terror that he will make false statements and be subsequently indicted. This places anyone who files an “INCOME TAX” return completely at the mercy, ARBITRARILY, of the IRS officials by the IRS officials own design. This is FRAUD by IRS, for which IRS officials are virtually impervious to attack by the individual citizen through the Judiciary system. IRS returns demand amounts and sums be quoted in “DOLLARS” (an artificial device), which they repeatedly refuse to define! IRS practices UNLAWFUL, as opposed to ILLEGAL, obtaining of the citizen’s property BY DESIGN, but without criminal intent, and WITH the ASSENT OF THE OWNER obtained by INTENTIONAL and SUCCESSFUL employment of CUNNING DECEPTION and ARTIFICE which is actual and positive fraud. Fraud employed by IRS to coerce citizens, who are not impervious to attack through the Judiciary system, into exposing themselves to possible fraud and/or perjury indictment by IRS for “FALSIFYING” IRS returns and documents BY NOT LISTING receipts of “TAXABLE INCOME,” “MONEY,” “DOLLARS,” AND “FIXED VALUES” which are all items the citizen is being forced to acknowledge exist, but which are not defined in IRS regulations. 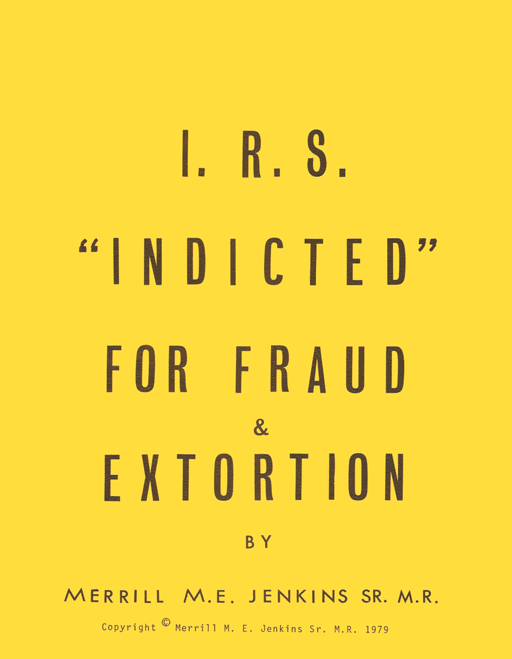 The IRS USES FRAUD with impunity to force the citizen to “VOLUNTARILY” comply with IRS dictates by threatening prosecution for willful failure to file, BUT if you file truthfully you become liable for prosecution for fraud and/or perjury which can be ARBITRARILY instigated by IRS if they do not like the citizen’s definitions for the things that are NOT defined by IRS officially. If you think that they may be irrelevant and frivolous, BUT you wonder why the officials will not answer them then you are one of those citizen-victims for whom this book was written. In law, to invoke the jurisdiction of the court, you must cite a claim upon which relief can be granted. Over and over again the IRS officials have been asked these questions with the knowledge that answering them with definitive citations of law would have ended the fears and terror-of-IRS felt by the citizens, and yet they would not and will not answer; perhaps because they cannot. In all fairness let us realize that although they practice and perpetuate fraud by the use of this artifice “DOLLAR” they were not the inventors of it. Dollar is a unit of monetary measurement. One dollar equals one hundred cents and one cent; equals one one-hundredth of a dollar — when did you start referring to a unit of measure as an entity (existing thing)? Examine the following chart carefully and see if you can agree that we have all been guilty of a transposition of terms. SO! WHAT IS A DOLLAR OF MONEY? AND WHAT IS A DOLLAR OF VALUE? The term ‘Dollar’ is as well accepted as the term ’Mermaid’ but neither can exist in actuality! Can you describe a Peck of pecks? “… The money of account of the United States shall be expressed in dollars …”Sec. 20, Coinage Act of 1792. “The money shall be expressed in dollars. The money is not dollars — dollars are not the money! Dollar as the unit measurement of money — cannot be the money! What is the money? Printing the word DOLLAR on pieces of paper does not allow that paper to become money! “Federal Reserve Notes are not dollars!” Treasury, Federal Reserve, and the I.R.S. Taking the words “will pay to the bearer on demand … gold and/or silver coin” off the paper DID NOT ALLOW the paper to remain as a new form of lawful money! What is the new, lawful, money of account, of the United States? The mere marking of the word ‘DOLLAR’ on pieces of paper DOES NOT make that paper lawful money of account of the United States! The copper-nickel coinage cannot by law be current as money within the United States for it would then be debased coinage within the meaning of Sec. 19, of the Coinage Act of 1792. The mere stamping of the word DOLLAR or its fractions on copper-nickel tokens DOES NOT make them lawful money of account of the United States. What, is by law current as money within the United States? “Money” is not a thing in and of itself. Something with distinctness of being must be called “money.” Dollar as a unit measurement of “money” must be applied to something that by law is current AS money within the United States. This something then is the “money” of account of the United States and is expressed in DOLLARS. The word ‘DOLLAR’ cannot be the money of account expressed in terms of itself! For any court proceeding to go forward it is mandatory that a money of account of the United States be established by law so that the expression ‘DOLLAR’, as a unit of IT, may be determined. The word ‘DOLLAR’ cannot be a unit of value. Value is divided into “value in use” which is subjective, and “value in exchange” which involves worth. “Value in use” being SUBJECTIVE does not allow the expression ‘DOLLAR’ to be a standard of value! In 1971 I first published “Money the greatest HOAX of Earth.” It was after the second printing in 1973 that I realized the word HOAX was still inadequate to describe the thing I wished to expose. In an effort to bring understanding I had written a textbook complete with a glossary of terms used. A textbook, however, is too time-consuming to read and not everyone wishes to become a scholar on the subject of money. In my second book “Everything I have was ‘THEIRS’ “ I tried to write as I would in a letter to a friend and it was an improvement. With that same approach in mind, I will endeavor to create a frame of reference for these three totally imaginative “ENTITIES” that have been subliminally induced into the minds of humans as existing things. One who has been or is easily deceived. To delude; deceive; gull. — dupe, gull, trick, hoax mean to delude one by underhanded means. Dupe suggests unwariness in the person deluded and the acceptance of what is false as true, of counterfeit as genuine, or the like; WEBSTER. When those unaware, are unaware, of being unaware and the scope of the HOAX includes almost all of the Earth’s population; how does anyone go about exposing it? To be duped one would have to have been “un-duped” prior to the “duping” procedure. To perpetrate a hoax there would have to have been an “un-hoaxed” condition preceding the hoax. There aren’t any words available to associate with or describe the “hoax” I wish to expose. Like trying to explain calculus in terms of simple arithmetic, I will attempt to expose a “hoax” which was here before I was born. I would begin by explaining that I believe there are three levels to our understanding that must be identified in order to provide a frame-of-reference for the subject of the “hoax.” Real things are objects that can be perceived by the five human senses in one way or another. You can SEE something. You can HEAR something. You can TOUCH something. You can TASTE something. You can SMELL something. I would call that the FIRST level. There are things which are objects of thought. Things which are readily understood because a mental picture has been created and accepted by humans as an identity and entity, but only in the mind. If someone is discussing “Mermaids” a picture flashes in your mind and you know the object of thought that is being discussed. There are many similar objects of thought (imagination), Leprechauns, Easter Bunnies, Unicorns etc., etc., I would call that the second level. The second level is unique in that objects of thought are in the second level because they do not and cannot exist in the first level. However, all things in the first level can be objects of thought as well. There are things which cannot be perceived by any of the five human senses but are very “real” to us. They are the units of measurement. Inch, ounce, quart, etc., are some of the units of measurement which cannot be perceived as themselves; they do not exist in the first level or second level. An Inch of string, however, does exist in the first and second levels. However, “Inch of string” being a whole distinct, individual thing is still three words “inch,” “of,” and “string.” The “string” is visible, and touchable; it exists in the first and second levels of understanding. The word “inch” gives the string linear dimension. However, the word “inch,” in and of itself, cannot exist in either the first or second level of understanding. Without a thing to be measured the word “inch” hasn’t any existence at all. The word may be uttered but it does not create a mental picture in and of itself. If one separates thumb and first finger to illustrate an “inch, “ again the “inch” has supplied linear dimension to the separation. Without some thing, from the first and second level of understanding, for linear dimension to be applied to, it does not have existence. These units of measurement such as inch, grain, hours, degrees are all exactly the same for all people. Definite, determinate, quantities of linear dimension, weight, elapsed time, or temperature. All these terms exist in the third level of understanding. They cannot exist in the first or second level except by application to, and in association with something that does exist in the first and second levels. Stripped of application and association they do not exist at all. To measure a given unknown quantity of any kind is to find how many times that quantity contains another known quantity of the same kind. The latter quantity is called the “unit” in which the result is expressed. A concrete representation of a unit is called a standard. Inch: Unit of linear measure equal to one-twelfth of a foot. The common English inch is equal to 2.54 centimeters. It is usually divided into halves, quarters, eighths, sixteenths, and smaller units in powers of one half, but is sometimes divided into tenths or powers of one tenth. During the Middle Ages, the inch was usually divided into twelfths, called lines, and thirds, called barleycorn; the latter term was derived from the statutory inch, commanded by Edward II of England in the 14th century, which equaled “three grains of barleycorn dry and round” laid end to end in length. In the United States and Great Britain the unit of linear measurement is the Yard; the standard Yard, which was established in 1854, is the distance between two lines crossing two gold studs set in a certain bar of Platinum kept in London, the measurement being made when the temperature is 620 F. and the barometric pressure is 30 in. Hour: The twenty-fourth part of a natural day; sixty minutes of time. The National Bureau of Standards … has custody of … the only Atomic clock in existence, which is operated by a system of radio waves and electrical impulses controlled by the vibrations of a nitrogen atom in an ammonia molecule. Gram: I cm3 water at maximum density. None of the above quotes mention a unit of measure for “value.” However, Black’s Law Dictionary and Webster’s New Collegiate Dictionary both refer to “money” as a measure of “value.” For most of history, prior to June 1968, commodities used as mediums of exchange were called “money.” The Encyclopedia definition used above does not mention “money,” but it does mention “… the power of a commodity to command other commodities in exchange …” which refers to a commodity used as a medium of exchange, or “money.” “Money” in and of itself does not exist in any level of understanding. Without being a reference to a commodity as a medium of exchange “money” does not exist. “… in its strict technical sense … “money” has no technical meaning …” That has to be the preeminence of ambiguity! Without the presence of a commodity, used as a medium of exchange, “money” has no meaning at all. “The United States monetary unit of value, sometimes called the “monetary standard” or “unit of account, “ is the gold dollar. This unit represents 12.632 grains of gold, nine-tenths fine. Put another way since October 18, 1973, the fine gold content of one dollar is equal to slightly more than one-forty-second of a troy ounce. Since ratification of the Bretton Woods Agreement Act of July 31, 1945, this unit cannot be changed without consent of the Congress. “U.S. CURRENCY” publ. of the BOARD OF GOVERNORS of the FEDERAL RESERVE SYSTEM 1974. “The … value … “standard” or “unit of account, “ is the … dollar … 12.632 grains of gold, nine-tenths fine.” This quote from the Publication “U.S. Currency” by the Board of Governors of the Federal Reserve System revised in 1974 is confirming that United States “money” is gold measured in standard units of dollar quantities which are 12.632 grains nine-tenths fine gold each. The commodity that the word “money” refers to is gold nine-tenths fine. The “unit” that the word “dollar” refers to is 12.632 grains. Without gold coin in current use there is no United States “money” in current use. Without “money” in current use there are no “dollar” unit quantities of it. What took the place of “money?” What took the place of “dollar” quantities of a non-existent commodity? The word “dollar” was here when you were born. It was accepted as being the commodity and its unit measurement at the same time. Almost everyone believes there is a dollar’s worth of dollars. Asked to stop and reconsider the public becomes confused. The public has believed since birth, a dollar, is a dollar, is a dollar. Dollar was a unit of measure like inch, yard, gram, hours, and minutes, when there was a commodity as “money” to be measured. However, dollar was a limited unit of measure, limited to gold and silver coin as the money of account of the United States. Try to picture a “dollar” without getting a picture of a tangible token or gold or silver coin. As a means of understanding the difficulty; try imagining a “Quart” without it being a “Quart” of milk or something tangible. Try to imagine as an object of thought — a Quart of Quarts. Try to get a mental picture of the contents of a glass of inches, or ounces. “Dollar” is unique in that it has a category all its own; it does not fit in any known level of understanding; it is sub-imaginary. A “dollar” is not a thing that exists in and of itself not even as a unit of measure since there is nothing to measure. “Federal Reserve Notes are not dollars.” RUSSELL L. MUNK ASSISTANT GENERAL COUNSEL DEPARTMENT OF THE TREASURY FEBRUARY 18, 1977. “Federal Reserve Notes are not dollars.” JOHN E. BURKE ACTING DISTRICT DIRECTOR INTERNAL REVENUE SERVICE, ST. LOUIS, MO. June 27, 1978. The people have been accepting tangible, physical pieces of metal and paper as units of value representations of a nonexistent “ commodity” called “dollar.” It is not even an imagined “commodity” (there isn’t any mental picture). It is such a deception, that it is beyond the scope of the word “hoax” or any other words of my knowledge to describe. The deception described above is perhaps impossible for most people to accept. I would ask those people to seek the composition of a “dollar.” It is somewhere below the level of imagination, but I do not have any means of expression for that level of understanding. COINAGE ACT OF 1792 … NEVER RESCINDED BY CONGRESS. “247-4/8 grains = ten dollars, therefore, one dollar was: 247.5 divided by ten which equals 24.75 grains per dollar. This Act has not been rescinded by Congress …” Budlong Aug. 18, 1977, however, the Board of Governors on the Federal Reserve System quoted, 12.632 grains per dollar as of October 18, 1973, in 1974. In the same quote, the Board said it could not be changed without consent of Congress since 1945. Budlong in 1977 said it has not been changed since 1792. The Board in 1974 said it could not be changed after 1945, but that it had changed in 1973 — From what? To what? By whom? and where was Congress? “U.S. CURRENCY” Publ. BOARD OF GOVERNORS OF THE FEDERAL RESERVE SYSTEM Revised 1974. But, Budlong’s correspondence of Aug. 18, 1977, says: “… the same monetary system that was established on April 2, 1792, is in effect today.” And that Act specified 24.75 grains of gold as the unit dollar quantity. “… making the United States dollar, equally with gold,… “ the word “dollar” which was a quantity expression was hereinabove quote made an entity by subliminal implantation. Value which cannot be expressed in standard units, because of its normal arid natural nature of being subjective, was suddenly endowed with a unit standard (“dollar”) of a sub-imaginary nature. That has to be the Greatest Piece of Deception on Earth and “HOAX” is just not an adequate word to describe it. Only a concentrated effort to describe a “dollar” without, in the process, describing any other known thing could the final realization become fact in the mind — there isn’t any such thing as a “dollar.” Like the words LUCK and LOVE, which have probably been around far longer than “dollar,” “dollar” cannot be described in physical or mental terms. Even LUCK and LOVE represent “conditions” — “dollar” doesn’t represent anything — no physical thing, mental picture, or conditional state. “Dollar” is a word applied to physical tokens which represent an accepted BELIEF (CONFIDENCE) that somewhere, somehow, there is a thing called “money” and the tokens represent “units” of it. However, a token is something which represents what it is not. What is “money?” What does a “dollar” quantity of “IT” look like? Perhaps, after all this, you are still of the feeling, so what, YOU CANNOT EAT GOLD! I agree! I am not promoting the return to a “gold standard,” but I am promoting the abolishment of Legal Tender Laws and the return to any tangible, citizen owned medium of exchange and, through it, the return of citizen control over the policies of government. That’s right, but what does that prove? In the broad view gold and silver are no different than carrots and potatoes. They are all ‘production.’ What is important is not that you cannot eat gold (when is the last time you ate a Federal Reserve Note? ): what is important is, not that you cannot eat gold, but who OWNS the medium of exchange? How did they get it? When we used gold and silver coin and paper was a “claim check” that could redeem “deposited” coin, the coin belonged to the people who worked to earn it. How else could a miner of gold eat if he did not exchange gold for fish to eat? How on Earth could the fisherman ‘save’ if he did not exchange some fish for gold that would not spoil? G.N.P. “backing” for a “dollar” is a total HOAX — if a farmer sells a watermelon for $1.00 that “dollar” is then “backed” by the watermelon he sold — please! What happens if someone eats the watermelon? What “backs” that “dollar” then? Paper was never THE “money!” People accepted the paper on the value of the COIN it could REDEEM! Copper-nickel coins are not as valuable as silver coin (only 3% as valuable) that’s why “prices” are higher (reality = “money” has depreciated). When paper is “non-redeemable” THEY print it 24 hours a day — 7 days a week — THEY “pay” for the paper, “pay” for the ink, and use the printed paper to outbid the public at every turn in the marketplace for everything the public works to produce. THEY GET everything for NOTHING! The paper is accepted as the “money.” The paper can redeem 3%, but exchanges for 100%. The other 97% it represents is “demand deposits.” The “demand deposits” are OWNED by the “SPECIAL PEOPLE” who create them and ISSUE the printed paper to represent them. When — we the people — accept paper of “3% parity” for our 100% parity of produced goods — THEY who print (government) — and THEY who issue (commercial banks) — the paper can use the 97%, they get for nothing, to “buy” the copper-nickel for the coins, “pay” for the labor to produce the coins and the paper and outbid — we the people — to get everything THEY want for NOTHING! It really isn’t a “HOAX” because the condition was here when we the people — were born. A dollar, is a dollar, is a dollar has been accepted for centuries. Yet to this day no one can define a ‘dollar’ or ‘money.’ Can YOU picture and describe the CONTENTS of a glass-full of “inches"; “ounces"; “quarts” or any other ‘unit of measure’? There cannot be a dollar quantity of dollars any more than there could be a quart of quarts. Try to picture the unit of measure without the thing being measured. Try to SEE the ‘QUART’ without SEEING the milk or its bottle. Try to SEE an ‘OUNCE’ without SEEING any material or scale. Value, is something accepted as HAVING a unit of measure (standard) that, in reality, CANNOT have a unit-of-measure-standard, but we the people — are born into and grow up in a world that accepts that “money” is a measure of value and that the unit of measure (standard) for value in the United States is the “dollar.” Value is SUBJECTIVE and every known thing that exists has a different value to different people. We all form our own sense of values! There are no fixed values; there are only “fixed” exchange values and they are parities! When — we the people — accepted “redeemable paper” in our exchanges; the paper exchanged at the parity of the silver coin and gold coin it could redeem. Now that the present paper can only redeem copper-nickel coins of 3% comparative parity to our old silver coins; is it any wonder why the “paper dollar” has depreciated? (higher “prices”)! Now! The paper can only redeem 22.68 grams of copper-nickel clad coinage which is not lawful tender and is only 3% exchange value (parity). Now! — we the people — BELIEVE we are using DOLLARS of MONEY as mediums of exchange! No one from the Treasury, the Federal Reserve System, your bank or any financial University can define EXACTLY WHAT the money of account of the United States is today and exactly what measure of that is a dollar quantity! Please write or phone every official you think should know the answers, and find out “first-hand” what a “CONFIDENCE GAME” — we the people — are all playing. “Neither paper currency nor deposits have value as commodities. Intrinsically, a dollar bill is just a piece of paper. Deposits are merely book entries. Coins do have some intrinsic value as metal, but far less than their face amount. The unlawful obtaining of another’s property by design, but without criminal intent, and with the assent of the owner obtained by artifice or misrepresentation. Any cunning deception or artifice used to circumvent, cheat, or deceive another. Story, Eq. Jur. 9 186. DENIS KARNOFSKY CHIEF ECONOMIC ADVISER ST. LOUIS FEDERAL RESERVE BANK ON “NEWSMAKERS” CH 4 T.V. JUNE 10, 1978. How long will the “… people …” remain “… fooled …”? The citizen in accepting a metal or paper token as being a “dollar” is in actuality swindled of 97% of the parity he should receive. This fraudulent act is committed by each of us upon the other just as so ably expressed by George Washington in 1789. The fact that we are not aware, which keeps it from being felonious, notwithstanding, we are still losing 97% of everything we offer in exchange for a “dollar.” If we are forced by IRS to accept the receipt of “dollars” as “income” then we are “taxing” ourselves upon our loss. Then the IRS in taking additional “income tax” from the citizenry, based upon this loss, is accepting that which is not due them. THE FACT THAT IRS IS SO SILENT ON THESE AND OTHER QUESTIONS SUPRA IS A VERY CONDEMNING INFLUENCE UPON A BELIEF THAT THE IRS IS TOTALLY UNAWARE. THE FACT THAT THE COURTS WILL NOT ALLOW TESTIMONY ON THESE AND OTHER POINTS CONCERNING “MONEY” AND “INCOME TAXES” IS ALSO VERY SERIOUS. In a very recent case of IRS “entrapment,” my testimony was not allowed to be given on behalf of a Defendant, in a Federal Court, because the Judge decided, for the record, my testimony would be irrelevant. In a short conversation with the Judge, in the courtroom during a recess, I advised the Judge that if the people could not get justice through the Judiciary they would have to take it to the court of public opinion. THIS BOOK IS THE FULFILLMENT OF THAT PROMISE. Others and myself as individuals and officials concerned with the preservation of our LAW (the constitution) have become united in common purpose and decided to name ourselves — individual, as opposed to a group, CONSTITUTION CONSERVATION CONSULTANTS. The following letter was dispatched to IRS to inform them of our intentions. Since our letter predates the above quotation — one wonders? Your agency has received correspondence from Mr. Merrill M.E. Jenkins, Sr., M.R. (Registered, April 26, 1977, United States Patent Office, Reg. No. 1, 064, 425), of St. Louis, Mo., and you have in your possession a taping of a radio talk show by Mr. Amos W. Bruce, also of St. Louis. The above items, along with other items sent to the IRS deal with questions regarding the “Money of account” of the United States and “Debt monetization,” and their significance in relation to the regulations under Title 26 of the United States Code. It is the desire of this organization to help persons from inadvertently breaking the law and at the same time contributing to your burden of paperwork. Consistent with this, the Constitution Conservation Consultants have under consideration a recommendation that training sessions be inaugurated in order to give large numbers of persons a better understanding of their filing status and to instruct them formally so that they will be in conformity with the law in the future. Pending advice as to your wishes, a conference has been tentatively scheduled for Monday, March 5, 1979, at 10:00 a.m. The conference will be held at 29 N. Meramec, Rm. 109, Clayton, Mo. Please advise within 14 days whether or not you wish to attend such a conference and, if so, kindly confirm the suggested date and time or suggest an alternative date at your earliest convenience. If you do not respond at all within the 14 day period and you do not attend the conference, or if you fail to offer any proof to substantiate your position pertaining to filing requirements of individual income tax returns by March 19, 1979, we will assume that you are condoning the initiation of our intended program which will be based on facts enumerated in the above-mentioned correspondence and tape recording. Furthermore, we will be informing those persons who erroneously filed in the past that they should immediately request refunds from the Internal Revenue Service of any and all units of monetized debt that, because of their ignorance of the law, they might have inadvertently and erroneously remitted to your office. It will not be necessary for you to send any information regarding penalties, etc. for disobeying any laws as it is our intention to remain at all times within lawful parameters. Furthermore, it will not be necessary for you to supply us with any information related to anything beyond the narrow subject of the “money of account” of the United States which is measured in dollars, and the accountability of “debt monetization” with respect to Title 26, United States Code. Even if you are unable to offer any information which would materially affect our beliefs, we would be desirous of establishing a liaison with your organization so that we can explain and discuss with you our total long-range objective which, with your help, will avoid any radical, disruptive changes in our economy resulting from actions by the government or the Monetary Authority (The Federal Reserve System). Author’s note: No response was ever received! All of the information in this book and the others I have written is worthless if it is not used. Knowing that the IRS does not have a citation of law for a particular thing doesn’t do you any good unless you can bring that fact out. It was my intention to overcome certain drawbacks in the cases I witnessed that led me to the course I followed. I analyzed that most defendants were refused the admission of evidence during the trial. Typical rulings are: Everyone knows what a “DOLLAR” is, The “DOLLAR” is not at issue in this case, The court will take judicial notice of what a “DOLLAR” is, The constitution is not at issue here etc., etc. Realizing that the only things that could not be denied as evidence were the documents that actually passed between the “TAXPAYER” and the IRS, I made absolutely certain that I wrote the IRS BEFOREHAND and told them in Certified Return Receipt Requested United States Mail every single thing I would ever want to say in a courtroom. The text of my correspondence is embodied in my second book “Everything I have was “theirs.” By the time I had researched their regulations and the Constitution I requested a refund of all amounts taken or accepted from me since June 24, 1968. In sending them “EVERY” argument I had in advance I may have defeated my own purpose, they may not wish to have my material admitted as evidence for a jury to ponder. By their diligent and persistent efforts to keep me from testifying on behalf of anyone else I must conclude that some of my arguments are somewhat distasteful to them. Earlier I mentioned that to invoke the jurisdiction of the court one must make a claim upon which relief can be granted. There is another thing that is equally as important and that is that you must exhaust all other avenues of relief before attempting to invoke the aid of the court. So sending your arguments and reasoning to IRS, to substantiate your views on “INCOME TAX” beforehand is just plain old PROPER PROCEDURE and the best assurance you could have that you will be able to give your argument in court if ever the need arises. All it would take to keep the people enslaved is to keep them convinced they are free while keeping them fearful of being jailed if they don’t waive their rights and defy God’s law (Ex. 23:1-2) by calling these unjust weights “dollars” on a 1040 confession form. FREE people don’t fear their servants! They fire them! It would help to keep them fearful of being enslaved by a country who has the same masters and who can not whip TINY Afghanistan in FOUR years. That country borrows from Western bankers and “The borrower is servant to the lender” — Pr. 22:7. WHO would challenge the wisdom of King Solomon? If someone could induce or force you to accept sticks of wood for all of your labor, wouldn’t that make you their slave? If merchants were induced to accept those sticks of wood from you, would you be any less a slave? If the sticks of wood were reduced to pulp, made into paper and printed green on one side and black on the other with portraits of dead presidents, would you be any less a slave? If the first users of that paper gave absolutely nothing for it, paid no taxes of any kind and were called “The Federal Reserve,” would you not be their slave? Who can deny that slavery exists when one group of people regularly and systematically, day after day and year after year take the production of everyone else without offering any production in exchange? Who can deny that there are 15,000 commercial bankers and 12 Federal Reserve banks plus all of their employees and uncountable government drones who are consuming production and offering no production in exchange? Who will deny that the job of the non-productive loot-sharing welfarites is to re-elect the government drones who protect the parasitic bankers? Who will deny that there can be no communism without bank credit and those sticks of wood reduced to pulp, made into paper and printed with portraits of dead presidents which appeal to patriotic thoughts? Who would accept the same paper tokens with portraits of Marx and Lenin? Who will deny that the Federal Reserve act of 1913 fulfilled the 5th plank of Marx’s communist manifesto and legalized what bankers were once hung for? Who can deny that the IRS is in fact George Orwell’s THOUGHT POLICE who neither want nor collect money and their job is to influence our thinking with FEAR and to monitor our thinking on 1040 confession forms which when filing, the signer waives his rights that millions bled and died to preserve for all of us? If you think what they want you to think (that checks are dollars) and report what they think you should report (that you received dollars), they might think about not bothering you. HOW can you send them MONEY when the Federal Reserve says your bank deposits are “merely book entries” and their system “works only with credit” and the IRS says that dollar bills “are not dollars”??? WHY should they even want the PAPER from us when government prints all they need to control us with?